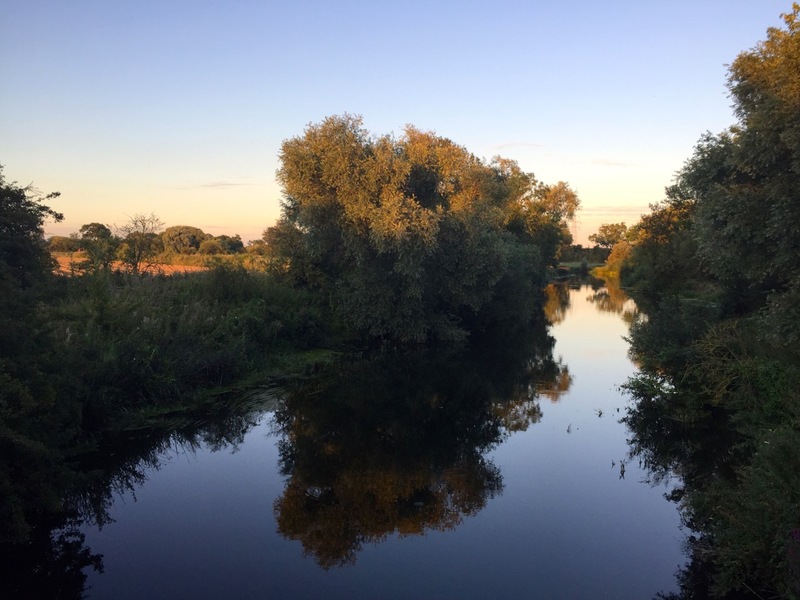 Richard piloted the boat through miles of undifferentiated green towards Bedford… The river, a muddy khaki brown color, the vegetation just a few shades greener…. No song birds, wildflowers or swans. Just a few dull ducks. And the sky grey. A constant roar of traffic in the background. Rain threatened. Passing through each lock seemed to take hours but at last we arrived in Bedford. But for some reason, that was not enough. We had to go further, to the end of navigable waters. So we cruised on under the rail bridge, beneath the impressive arch of an all-wood pedestrian bridge, past a golf course and a cricket pitch. We left the precincts of the town behind, weaving through an ever-narrower river until finally, with the end — Kempston Mill — in sight, we ground to an ignominious halt on a shallow bank of gravel. It took ages to reverse, and more ages to turn our 50-foot boat around. The prop, turning furiously, threw up great gouts of mud and decaying vegetation. For a while I had a vision of having to call the Environment Agency to come and rescue us from our own foolishness. But then at last we were underway once more. We decided to moor against a concrete quay and have a belated picnic. And it was while I was hammering a stake into the ground to secure us that I noticed the tree groaning with ripe sloes. Aha, I thought, sloe gin. Everything’s going to turn out well after all. On Friday morning we started the weeks’ long journey back to Braunston. The day before everything had looked grim. But today, the skies were blue, the clouds were white and fluffy. Greens of every shade imaginable lined the river banks and trees soared above us here are there forming cathedral-like canopies. Lipstick-bright wildflowers growing in great profusion along the river banks added splashes of colour to the green. A slight breeze soughed through the poplar leaves. Butterflies, bees and dragonflies flitted from flower to flower. Songbirds provided the soundtrack and grebes emerged from the water with fish clenched tightly in their beaks. 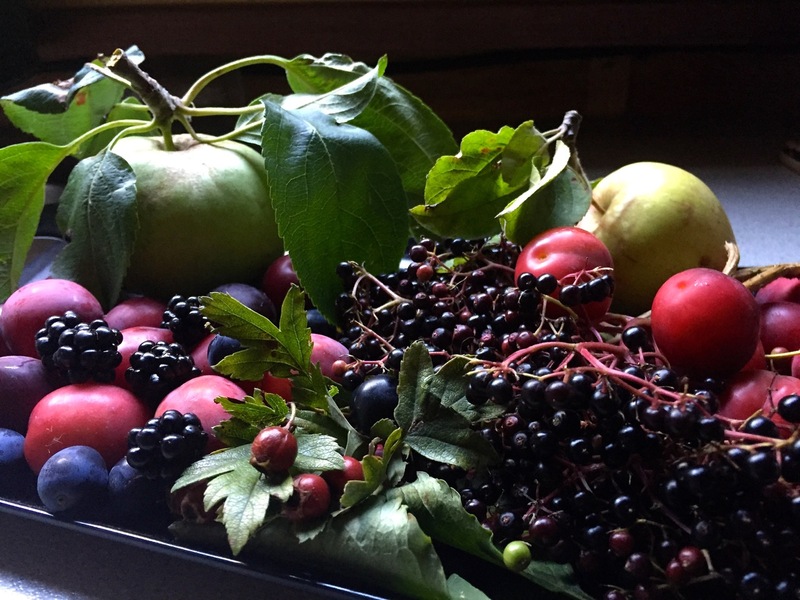 And on Friday night we celebrated the bounties of summer with a hedgerow fruit crumble. Gently mix the fruit together with the lemon rind, lemon juice, vanilla extract, 30g of the sugar and 30g of butter. Tip into a buttered baking dish. Mix together the ground almonds, oats and 60g sugar. Rub the butter into the almond mix. It will be quite a solid ball, not crumbs. Then crumble the dough over the fruit in pieces of varying sizes. Generously grind black pepper over the the crumble and bake in a moderate oven until golden.